My husband's all time favorite meal, I say this serves four, but in reality, he will eat two of the shanks on his own! Garlic mashed potatoes for him, mashed cauliflower for me. The mushrooms are so flavorful too. Heat the olive oil in a large heavy skillet. Rub the lamb shanks with salt and pepper lightly. 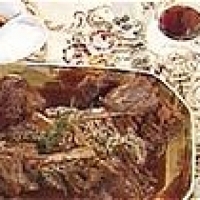 Brown the lamb shanks in the hot oil until browned on all sides. Do in batches, no way they will fit at once, at least not in any pot I own. In the drippings left in the skillet, add the mushrooms, garlic and leeks, cook slightly. Add to slow cooker. Add balsalmic vinegar and wine to the skillet, using a wooden spoon scrape up all the goodies on the bottom of the skillet. Add to slow cooker along with the rosemary branch. Cover and cook on low 8 - 9 hours. Mix the lemon rind, parsley, mint and minced garlic clove. Best served over mashed potatoes (mashed cauliflower) or a wide egg noodle to catch the wine and mushroom sauce. First time I've tried this recipe but sauce is slightly bitter-ish? Everything is exact measurements ,I'm cooking this in my heavy Dutch oven on slow ,should I put a spoonful of brown sugar in it? Thank you for the recipe. I'm going to try it tonight. I usually cook lamb shanks in a tomato reduction sauce; I think this will be a nice difference.